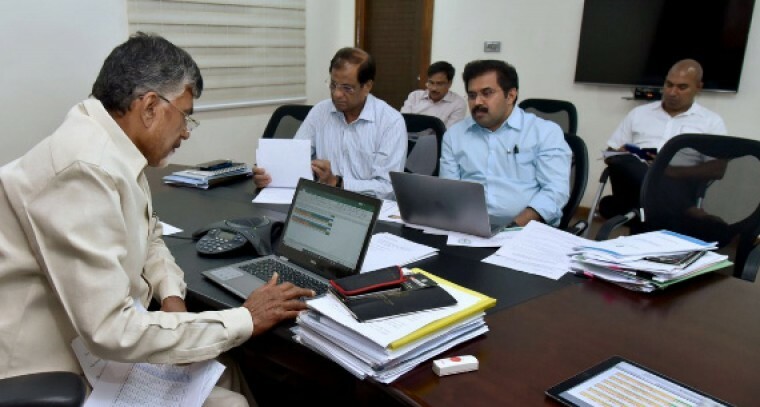 Reviewing the relief and restoration works in cyclone-hit Srikakulam district on Monday, Chief Minister N Chandrababu Naidu said restoration works were going on at a brisk pace with top priority on restoration of power, communication networks and distribution of drinking water. According to him, 15,000 of the 30,000 plus electricity poles have been re-erected and power has been restored in 36 per cent of the affected area. Similarly, 81 per cent of the communication network has been restored. Out of the 377 water schemes, 273 have been revived. Drinking water is being supplied through 356 tankers. Road connectivity has been improved in the affected areas to an extent. On the directions of the CM, Minister for Panchayat Raj and Rural Development Nara Lokesh stayed put in Mandasa of Srikakulam district. Earlier, he cancelled his visit to the US scheduled on October 17, 18 and 19 in view of the devastation due to cyclone Titli in Srikakulam district. The minister was invited by the World Food Prize award presentation ceremony in the US. Lokesh was invited to participate and deliver the keynote address on the agriculture sector in the country. He said the relief efforts were in full swing in the Titli-affected regions. Around 5,000 staff are working on restoring electricity in all villages. Around 300 tankers are continuously supplying drinking water. Essential commodities like rice and pulses will be distributed for free through ration shops. Rural roads are being repaired to improve connectivity. “Happy to see some lost smiles back on the faces of people. We’re doing our best to bring back normalcy as soon as possible,” he said. Speaking to the farmers during the inspection of crop damage at Rajam and yerramukkam of Sompeta mandal, Civil Supplies Minister Prathipati Pulla Rao said the government has decided to include the removal of uprooted coconut and cashew trees under the MGNREGS. He also said that the Chief Minister has also decided to issue coconut tree cutting machines at the subsidised price. The State Government has already announced ex-gratia of Rs 5 lakh to the families of the deceased in the cyclone and Rs 1.5 lakh as compensation to damaged houses. The CM announced Rs 20,000 per acre towards paddy crop loss, Rs 30,000 per acre for banana farmers and Rs 40,000 for replantation. The govt will pay Rs 1,200 per coconut tree, Rs 25,000 per acre for cashew farmers and Rs 40,000 for replantation. He announced Rs 6 lakh for the damaged mechanized boat, `1 lakh to the damaged boat and Rs 10000 for damaged net.